These 4 siblings were born about 5/4/12, to a stray mama kitty (mama has already been adopted). These kittens came into the adoption program on 6/22, and are being well socialized in a foster home; we expect they will be great indoor or indoor-outdoor kitties (though they should be kept inside until they are a bit older). All four of these cuties are boys! See their full listings, and all the other wonderful cats and kittens at the shelter, on our Cats Page (just click on the photo of the cat of your dreams to open its full listing). The shelter is super-full right now, so please spread the word to all your friends in the Pacific Northwest and help us find homes for everyone! Our first Stop the Cycle litter of kittens for 2012 has arrived – heralding the beginning of “kitten season” which will last from now through November. 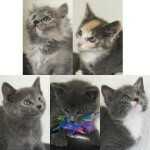 These 5 cuties were born on 2/12/12, and will be ready to go home 4/20/12. New adoptable cats: Peanut’s Kittens! These kittens were born 6/17/11, and were surrendered to the shelter along with their mom Peanut when the kittens were just 2 weeks old. We’ve had them fostering with our wonderful Foster Mama Charlene, and as a result, the kittens are all wonderfully socialized, very easy to handle, affectionate, curious, and playful – they will all be great in any type of family. See their listings, with many more photos and a video, from our Cats Page. 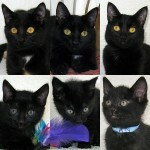 Our next batch of adoptable kittens to introduce: the C kittens. These cuties were born about 4/29/11, and were found in a wood pile, apparently orphaned (they were starving and no mom was located after 2 days of looking). 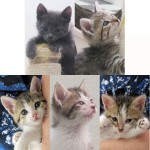 They are doing wonderfully in foster care, and will all be ready to go home at the very end of June/beginning of July. The six kittens in this group came in at about 2 weeks old, from a feral colony on which we are doing Trap-Neuter-Return. They were bottle-fed and are now weaning to solid food. The orange boys were born about 4/23/11, and the tabby quartet are a bit older, born about 4/19/11. *It’s hard to constantly come up with new names… to help us keep the litters straight, so we know who is who, we choose themes for each batch. Right now, we are working with alphabetical Spanish place names. Kitten season is in full swing here at Forget Me Not. Poppie’s babies got all the early press, from the novelty of having been born at the shelter… but now that they have all been chosen by adopters (and will all be going home in 7-10 days), the newcomers can have their moments in the spotlight! Our primo kitten foster mama, Charlene, has been caring for 6 bottle babies who arrived from a feral colony at about 10 days old, plus another mom-cat and her litter of 5 who arrived when the kittens were just a few days old. Luckily, she has help from some of our other kitten-loving volunteers, like Kelsea and Carlene and Laura! Do you know a Ferry County resident who is littering? I don’t mean tossing fast food wrappers out of their car; I mean creating unwanted litters of puppies or kittens, because they have been unable to spay their female pets. Forget Me Not has a fabulous program to help end the “littering” problem in Ferry County. Our Stop the Cycle program gives residents with an “oops” litter a way out. We will take in the entire litter of puppies or kittens after they are weaned, and will make sure each is spayed/neutered before going to a screened and approved adoptive home. There is no surrender fee for Stop the Cycle litters; the only requirement is that the owner allow us to spay the mother animal, at little or no cost to them.